Small and lightweight, the 12 oz bottle is great when space is limited. In addition to use as a reusable water bottle, it’s the perfect size for juice and other naturally sweet drinks. 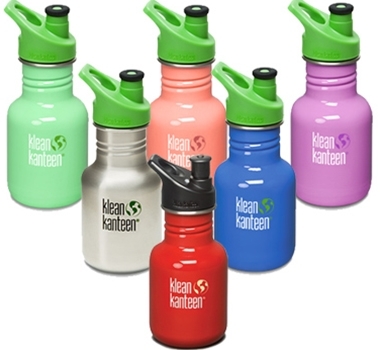 Each Klean Kanteen includes one polypropylene sport cap with purchase. Additional or alternate caps are available below. Please note that Indicator red comes with a black cap, and the remaining colors come with green. Your Klean Kanteen™ is made from thick, 18/8 (#304) stainless steel and is designed to be lightweight yet extremely durable. If you take care of it, it may very well last your lifetime. Here are a few tips to help keep your bottle fresh and clean over the long haul. Your bottle and polypropylene caps are dishwasher safe. Colored bottles should be hand-washed. For daily cleaning, just rinse your bottle with warm, soapy and let it drain and dry in your dish rack with the mouth downward so water can drain out. For thorough cleaning, you can use warm, soapy water and a bottle brush. We also recommend an old-fashioned cleaner: diluted vinegar or water and baking soda. Stainless caps should not be washed in a dishwasher because water can get inside the cap. When Klean Kanteen debuted their colored bottles, the most important thing to them was to find a safe and durable paint that also looked dynamite. They reviewed and tested dozens of different paints and selected an acrylic paint that contains no toxins or lead. Just like anything that's painted, it is possible to chip or scratch the paint on your colored Klean Kanteen™ bottles. To prolong the life of your paint, handwash your bottle and don't use abrasive agents to clean it. Klean Kanteen also heard from some parents that their child has chewed on a colored bottle and ingested some of the paint. If this happens, don't worry, the paint is perfectly safe. Though our paint is safe, Klean Kanteen recommends their stainless steel finish bottles for small children who like to chew on things.